Speck CandyShell Card Holds Cards So You Can Ditch Your Wallet | OhGizmo! I’m a simple person, who likes to get the most bang for my buck. This is why when I purchase a gadget, or even an accessory for one, I like to to serve more than one function. For instance, if an iPhone case doesn’t do more than look nice while protecting my phone, I’m likely not going to drop any money on it. However, if it can replace my wallet, I’m sold. 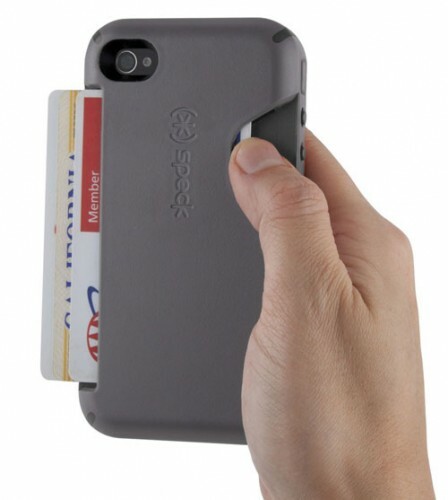 This CandyShell Card case from Speck not only looks stylish, but is going to hold three credit-card sized cards. This means that I can take my debit card, ID, and another card, while leaving my wallet at home. It’s not the first case to hold cards like this, but it does look a bit nicer than the others I’ve seen. For $40, it’s a good way to reduce the number of things in your pockets. Can the magnetic strip on the credit card or bank card take the radiation coming from the phone?